Come out and meet your Rosemead Special Assignment Deputies from the Los Angeles County Sheriff’s Department, Temple Sheriff’s Station as they get into the holiday spirit. 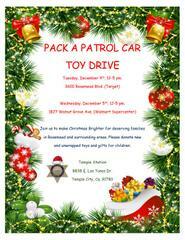 The Rosemead’s Special Assignment Deputies are seeking unwrapped toys to Pack-a-Patrol Car Toy Drive on Tuesday, December 4, 2018 from 12 pm to 5 pm at Target Store, 3600 Rosemead Boulevard and Wednesday, December 5, 2018 from 12 pm to 5 pm at Walmart Supercenter, 1827 Walnut Grove, Rosemead, 91770. The toys/books donated will be distributed to the underprivileged children (18 years and under) living in the City of Rosemead in the hopes of brightening their holiday season. For more information, please contact Mandy Wong, Public Safety Supervisor at mwong@cityofrosemead.org or (626) 569-2168.